I love how enthusiastic the reaction to our new website has been. Even a few non-digital natives have said they're coming to love the navigation. People are highlighting quite a range of different points, however. So I thought it would be useful to share a few of them, enabling everyone to benefit from the various ways to use and access the articles. Number one. 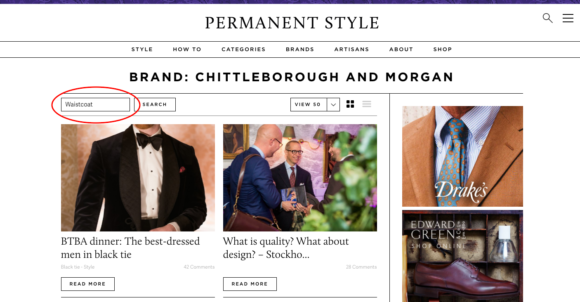 You can now find all the information on any brand or artisan by finding their dedicated page. Artisans have their own page, with everyone listed alphabetically. I've generally defined 'artisan' as someone that makes bespoke. And brands - those doing ready-to-wear - have a separate page. You can browse all of the scores of names by scrolling down, or search for a particular one using the filter box in the top left (shown below). 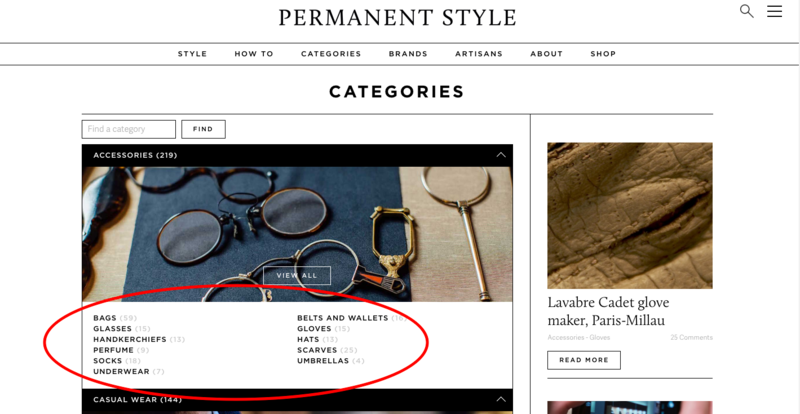 Once you're in a brand or artisan's page, you can then search all the posts on them for something particular. So in the example below, I have navigated to the Chittleborough & Morgan page, and then started to search for 'waistcoat', to see if there is any information about waistcoats they make. It's nice that everyone has their own page. In some cases it's more information on makers in one place than anywhere else. Certainly than on their own websites. Two. To make navigation of the whole site easier, there is now a full menu in the top right of the screen - opened by clicking on the three parallel lines, known as a 'hamburger' menu. This pulls up a list of all the navigation, the categories, and the general links like Collaborations, Advertising and the Newsletter. It's good for an overall feeling of the site, and helps find additional material that isn't in the main navigation. (Three.) Talking of deeper navigation, the Categories page has been expanded with a comprehensive list of sub-categories. So there is a dedicated area for Weddings (very topical at the moment). There are ones for not just Oxfords and Derbys, but Monk shoes and Loafers too. And as shown below - for every type of accessory. I'd encourage readers to look through these categories, principally because a lovely thing about Permanent Style is the way readers ask questions on old posts. So every year, when wedding season comes round, there is a new set of questions on the posts, which I answer. It becomes a consistently updated resource, a reference tool. Which as long-time readers will recall, is what I always wanted. Not just a spewing into the ether (think most new social media), but an evolving, ever growing project. Point four. Readers used to complain that they easily missed the most significant - the most popular, or useful - posts. That these should be made sticky. An example is the range of 'How to buy' posts that I originally wrote for the Financial Times' How To Spend It magazine, explaining the basics of buying quality in a watch, a pen, a bag etc. Those are now highlighted. 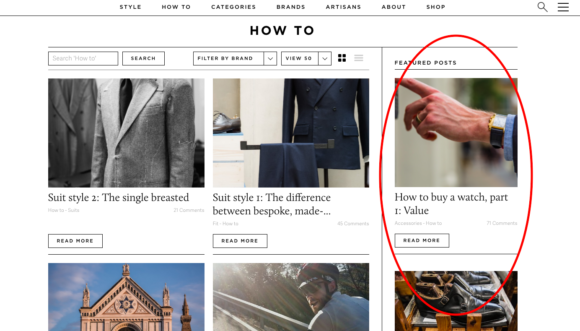 The most popular 'How to buy' posts, for example, are now 'featured' on the right-hand side of the How To page. Finally (thank you for reading this far), the search. This does a whizzy little thing and pops up as a lightbox when you click the magnifying glass. But more importantly, it takes you to a list where you can see images for the search results. Given how visual our topics often are, this is usually a much easier way to find what you're looking for than just searching the text. I hope these tips are helpful in mining the Permanent Style archive. Enjoy, and keep the feedback coming. You can follow the discussion on How to use the new website by entering your email address in the box below. You will then receive an email every time a new comment is added. These will also contain a link to a page where you can stop the alerts, and remove all of your related data from the site. Even the contents aside, this blog is arguably the best out there: very clean and easy to browsing! Thanks for the overview. The new design takes some getting used to, but I do like the more categorized approach. I’ve enjoyed the site so far. While I’d like to consider myself well read in some of these topics already, there are tons of new points and more details which have been very informative. Wonderful looking site! Keep up the great work. Love all you do. Just saw your piece for HTSI on bespoke cufflinks, fantastic by the way, and wondered if you were going to do a fuller review with pictures for the site? Thanks! Just for clarification, what exactly is a bespoke cuff? Like a bangle type thing, or a shirt cuff style? I assume the former. Simon: Curious on your thoughts and what the fashion world buzz is about Brioni’s new fashion director, Justin O’Shea? Where do you see his vision taking Brioni? Congrats on the new site design! It is truly fantastic. I live in the States (Chicago and San Francisco) and am looking for a first suit and tuxedo to wear, as I am an opera singer. SuitSupply seemed too contemporary (tight) and I’m wary of MTM when there is no tailor making measurements. Despos in Chicago has been recommended but I think I don’t know enough to appreciate that quality, and plus unstructured might be a weird look for performances. Where can people go to be measured by an actual tailor and have decent classic MTM clothing made? I’d recommend Chris to be honest, Lawrence. Bespoke can make a real difference for performers, principally because of the high armholes and sleeve. You’ll sweat, but have far greater freedom of movement. Wow — didn’t get the follow up email notification and am so glad I checked. Thanks for the personal reply! Now, I just wonder if a performer could really show up in a totally bespoke garment and not look arriviste. Perhaps there’ll be no problem if it’s simple black and simple dinner jacket? By the way, the comment reply form on mobile web is a bit broken — left 10 px cropped off. Yes, if it’s very subtly styled then no one should notice it’s bespoke – just that it somehow looks better, but they can’t say how (it’ll be mostly fit, then quality). Thanks on the web points. Are you saying that you signed up for the email notification but didn’t get one? Yes, I sign up for email notifications but don’t get them. Hence the late reply! Forgot to mention that I am 1.91 m tall with very narrow shoulders. Even finding shirts that fit is a challenge…TM Lewin doesn’t go that long for my 16.5 in neck. Is there any way I can view your site as a singular continuously scrolling page? There are some news sites which dynamically feed new articles once you finish the prior; wonder if your site has this functionality too? If not, is there anyway to aggregate your site in a “feed” style with a RSS Reader? Not currently, no. Interesting point though. While I do enjoy the new classification and search functions, I find the topics have become more commercial over the latest. At least compared to previous years, when you presented topics from a customer’s point of view. Of course I understand things develop and one has to make choices about which way to go and grow. 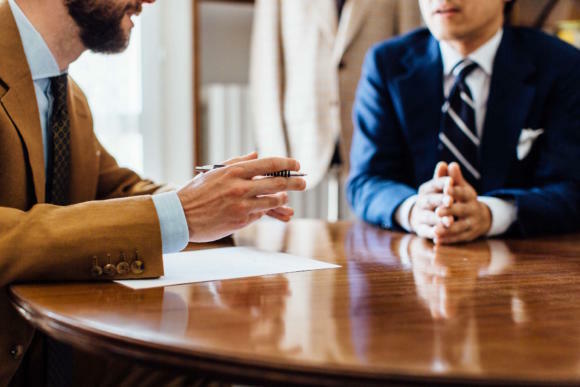 But sometimes it’s not that clear any longer who you represent, a customer’s or a brand’s point of view, the buyer’s or the seller’s perspective? Just my personal impression. I still enjoy your reviews of bespoke pieces a lot!